Josephine Ekström is the founder of Lily & Oscar. The Swedish brand is known for Ekström's sought after styling abilities. Her mix of modern elements, design classics and antique details marks her unique style. Her aesthetic is also reflected in her online shop. The webshop is home to everything from large-scale furnishings, like sofas and tables, to velvet cushions, Moroccan rugs and African textiles. All of this and more can be seen in her Swedish home. A laboratory of sorts for this interior stylist, upon entering, you san see Josephine's aesthetic come to light. Ekström has a way with the modern mix. At home and in her styling work, this designer is able to blend global elements seamlessly. Much of it has to do with her restrained color palette. Shades of white, cream, brown and black dominate the hues she enjoys working with. In her living room, the colors come together effortlessly. They are combined using textiles, like the kuba pillows on the sofa. Leather seating, a small Saarinen tulip table and an arched floor lamp all fit within the room's neutral color theme. Many of the items featured throughout Josephine's home can also be found in her online shop. Here in her office, a large, artisan dining table is perfect for working at. It's no surprise that this stylist has created a stunning vignette on top of the table—stacks of books, a mix of candles, and carved statuary all stand out. For a pop of color, a stack of velvet cushions from the Lily & Oscar completes her the look. Many people struggle with ways to style the dining room. The room that is built for entertaining, can also be a beautiful place of displaying collected pieces. In this dining room, it's all about the color palette. Black and white come together, grounded by a striking gallery wall. Photography, sketches and illustrations are all beautifully framed to create an artsy touch in this dining area. Around the circular dining table, a mix of modern chairs offers comfortable seating. The finishing touch in the dining area is a bold modern pendant. The glass and chrome piece definitely brings a vintage feel home. This home is full of so much cool contrast. White walls are met with painted doors in a bold black shade. The two shades work together to create drama in the space. The black and white color palette also brings attention to this home's architectural details. Tall ceilings, large double doors and detailed trim truly stand out among all of the black and white. Large black doors transition you from one room to another. The large doors beckon guests to come in. Here, they open onto a cozy seating area perfect for lounging. Josephine has a love for mixing numerous aesthetics. In some rooms of the home colorful Moroccan rugs stand out. In others, baroque mirrors make a big statement. And then there are all of the modern elements that make a statement at home as well. In this seating area, a Ligne Roset Togo sofa is a classic statement piece in the interior. The sectional is one of the most comfortable pieces ever designed. 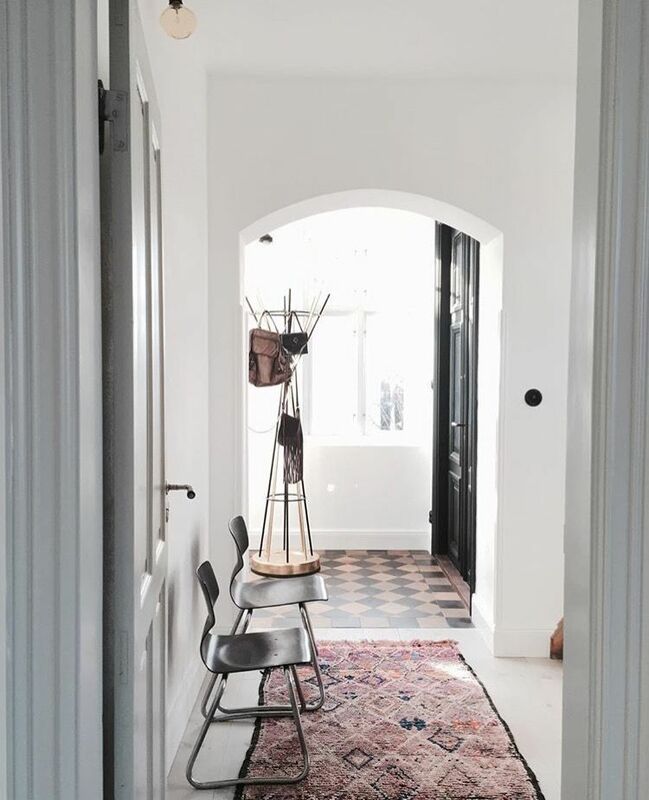 And it looks especially cozy in this white room, where a purple vintage rug from Morocco adds a pop to the black and white color palette that dominates the space. Another set of large black doors are an entryway to the bedroom. The space has been designed to be a quiet retreat. Like the rest of this Swedish interior, the design feels effortless. The cozy aesthetic that Ekström has created flows beautifully from one room to another. Peeking beyond a cream Beni Ourain rug, the bedroom is a cloud of neutral linens atop painted wood floors. Just another example of how she is crafting a design aesthetic that blends neutral elements, beautiful furnishings, stunning accent pieces, and global elements to create a space that feels like home.